I first started training for triathlons back in 2001 where I thought I’d do a sprint triathlon, that being a 750m swim, 20km cycle and a 5km run. All the training went well, then race day came. Took it easy for the first race as I didn’t know what to expect. Ow WOW, what a race, the adrenaline of the swim, climbing on your bike for the cycle with a bike I borrowed from a friend and then having jelly legs for the run, with the crowd calling my name as I came close to the finish line. Ok so it wasn’t a crowd just my mom my biggest fan on the day . I finished the race in the top half of the field, which I was happy about. Once I had got, unpacked the gear, cleaned up, relaxed and spoke to my family about the event, telling them that this is the sport for me. The next day came and I started already looking for the next sprint triathlon, I was hooked. As time went by I continued taking part in more triathlons and made more triathlete friends. Stepped up and started to do the Olympic distance (1.5km swim/40km cycle/10km run), (back then we called it a “standard triathlon”, it only got the name Olympic distance stuck to it from the 2004 Olympics), Half Ironman (1.9km/90km/21km) all the way to then Ultra distance Triathlons (3.2km/120km/32km). The longer the distance in the triathlon the fewer races there were. 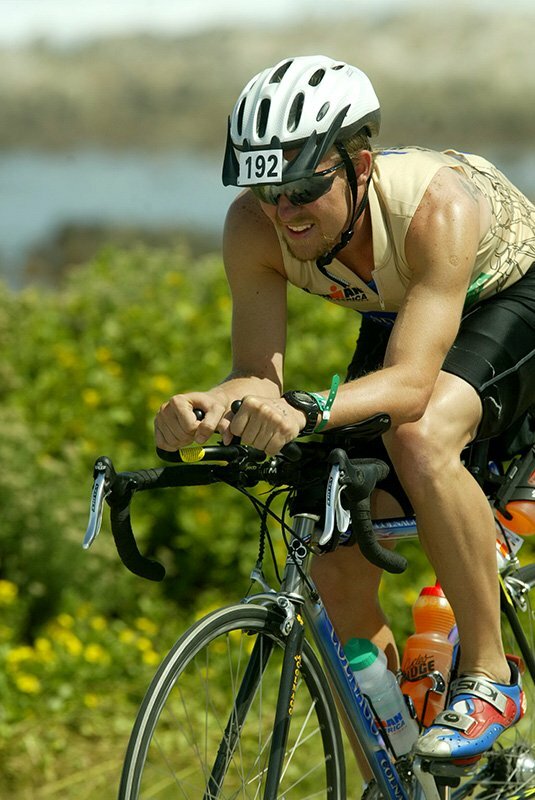 There was always talk of the big race that the tough triathletes did in Gordons Bay in the Cape area called Ironman. South Africa use to have an Ironman race in the late 90’s but that stopped cause of the lack of participation, “I think”. 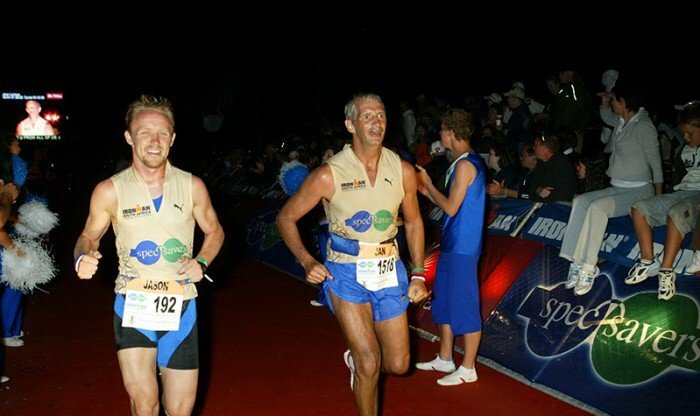 In 2004 the news broke that Port Elizabeth in S.A had got the contract to host Ironman for 3 years, the first year being a half, the next two being full. If it was a success, South Africa could keep the brand name. The Half Ironman race was broadcast on the radio as soon as the Leaders crossed the finish line. In 2005 the full Ironman was on same thing, the results were broadcast on the radio. It was then that I decided I will do this race. Knowing that they would only take 1000 entries, I entered the race in August 2005. There was plenty of time to train as the race was in April, so I stayed with my normal training for the Olympic Distances. Me being a procrastinator January was here and It was time to start training seriously for Ironman (Yes It was late for me to start). I heard my tough ironman friends were going on a training session, so I decided to go train with them. These are those triathletes that train hard and aim for a sub 10hour Ironman (The wrong people to train with for your first Ironman). It was a lovely Sunday morning 6am start for a 130km cycle followed by a 25km run. We started the cycle all joking around feeling good about the day and chatting what we needed to do, road in front of us clear few cars on the road was picturesque slight breeze on our backs nothing could go wrong this was going to be a great training day. As the group of seventeen of us, road in single file, a meter between each cyclist, the group got quieter, the pace started to pick up, we were feeling good almost halfway, how easy is this, Ironman is going to be a breeze. We got half way and turned around to head back home. Reality hit me. Sense of humour gone. Legs gone. Head wind strong. The group was going, one or two every now and then would drop back and ask me how I’m feeling, of course I told them I’m feeling great, I think they knew I was lying as I was about 500m behind them. Somewhere along the cycle I managed to claw my way back to the group. It was all a blur can’t say when. We had 8km to go so I told the two that had drop back to stay with me so I could draft them, they could go I’ll see them on the run. As they cycled away from me and the closer we got to the end of the cycle my eyes started to water, this was hard. I got back to where we had parked the cars, close to five hours after we had started from. All the other sixteen guys had started there run already. This was my break time. You read correct my break time, to break away and get out of there and go home, these guys are crazy did they expect me do a 25km run, no way in hell am I outing my running shoes on now. Don’t ask me where I got the energy from but I packed my bike on the back of my car, as fast as I could, climbed in and drove away, feeling relieved and in pain. Yes pain would I ever be able to climb on the bicycle seat again, the area down there was sore! I got unpacked the car sat in the lounge with my family and told them, Ironman was going to be a long day for me and them, as they were going to come down and support me. 21km Run On Saturday, 21km On Sunday…. Time went by I did pick up my training on the bike but nothing mote then 100km on the road and some indoor cycling classes (I knew the instructor it was me, that help). I didn’t forget my running did that religiously 60km a week. The one weekend even decided to run a 21km on the Saturday and a 21km on a Sunday, there you have it my first marathon done over two days. I was set for Ironman. Time drew closer to Ironman week. We made our way down to the coast line of Port Elizabeth on the Thursday. Got to the hotel, booked in and decide to go explore the city I was going to race in on Sunday. Friday time to pick up your race bag that gives you all the information you need to know about the race, the do’s and the don’ts, and the bags needed for the race. We got back to the hotel, we saw this athlete who just came from a jog and was stretching outside in the street. I decided to walk over and start speaking to him as he was a foreign athlete, just to find out is this his first one, small talk, told him he must go out and enjoy the race and do his best. Friday evening time to pack your bags for the race. If you don’t know (Like me) or haven’t heard the Saturday before the race, you have to take your bike and all the equipment you going to be using on the race, and hand it into transition the day before. You don’t realise how stressful that is, are you putting everything in the right bag. I’m sure I packed those bags at least five times, cause once the bags are in transition, you can only go back to them the day of the race to fix it. Saturday the worst day ever. The day seems to go by so fast as you have to take your bags (helmet and all) and bike, and have to hand it in at transition. Everyone is in such a good mood, speaking about the sea and how rough it looks. Talking about that there is going to be no wind and a good day is expected for the race. This is the time you start walking through the race in your mind and walking the course, so on race day you go straight to your bike. Once that is done there is no going back. The rest of the day you get all the best of luck wishes from your family and friends. The transition area is full of athletes that are well conditioned, some really toned bodies and some not so toned. Spectators everywhere and just a festive atmosphere. That evening at about seven the streets become quite like a ghost town. The nerves are there to stay the night. I know I climbed into bed about 20.30 I’m sure only fell asleep at 22:00. Alarms go of at 4am your day has officially started. The breakfast tables are quite. Everyone focusing, taking in that last bit of nutrition it’s time to go. As you get to transition and hand in your special needs bags(food and drinks you have prepared for you for the day). Get into transition, check that your bike tyres haven’t burst from yesterday’s afternoon sun, go look to see if your transition bags are there and check them again. Go to your family to say your goodbyes for the day. The count from the announcer starts. 20min to the close of transition. 10min to the close of transition. Transition is closed. 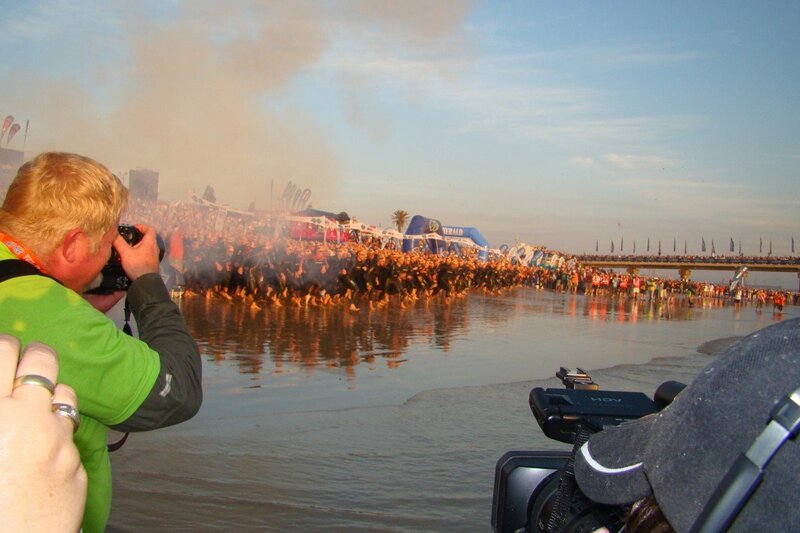 You put your tri-wetsuit on, zip up and start walking to the start of the race on the beach. You in the start area where you stand at your predictive time for the swim. African drums playing loudly behind you. Every athlete is still. You start to think of the day in front of you. You see the sea how still that is. Things are looking up yesterday that was rough. Flags are not moving on the flag pole. Time for the race to get started. The cannon goes, and so do the athletes. You are in the sea with the other 999 athletes fighting your way through the waves and through the athletes. Turn around the first buoy and on to the rest of the swim. The 3.8km swim then was a two lap course, first lap the sea was calm. As you make your way out of the sea onto the beach and through the tunnel of spectators, you think to yourself I’m here and sense of peace falls over you as you start the second lap of the swim. Swim is done time for the transition and the cycle. You get your wetsuit off. Helmet on, sunscreen on, extra food shoved in the back pockets of your top. Of you go, stage two. Cycle 180km, not allowing any outside help, no drafting(slipstreaming), no music on a 3x60km course, sounds long and hard, IT IS. O my Word, the first lap, loooovely, the rain we had helped you not think about the other 170km you might need to cycle in the rain, the fact that the wind had started to pick up, so 40km of the 60km loop was a head wind. Second lap, we were lucky the rain had stopped by then but the wind got stronger. Third lap, wind was strong, legs were tired, by this time I was fixing my third puncture while sitting on the floor wanting this cycle to end. No matter what I was going to finish this cycle all I wanted to be was of this bike. I thought my behind was sore on the 130km cycle, nothing compared to this. I was standing and cycling to help my bottom out. But the thing I was amazed at was the crowd. The support was amazing, your hair stood on end every time you cycled pass them. Cycle was done time for the transition and the 42km run. Cycling apparel off running shoes on, no need for sunscreen, it’s going to be dark in 3 hours’ time. You start running, the nice thing you don’t need to worry about the wind anymore as that has stopped and so have your legs. You want to get back on that bike and cycle the last 42km, but you can’t, so run and walk you have too. Walk you say, yes lots of it, anything just to get you to the end of the race. it’s the last discipline. All going well in the run. Water, other juices and some oranges every 2km nothing to complain about. Every now and then you get a reminder you are doing Ironman as a cramp will give you a surprise. This is normally the time of the race you can’t think straight, so when someone reads your name on your race number it takes you 3min to work out that you don’t really know that person as they just read your name on your number, that’s what make the crowd support so amazing. Your legs are tired but you keep on moving forward no matter how fast or slow you are going. As you get closer to the end, energy comes from nowhere and you start to run at 4min per kilometre (or you think you are, you actually running at 6min per kilometre). You get to the red carpet and you know you have done it you have made it to the end. As you cross the finish line the announcer calls out “you are an ironman”. The biggest smile across your face and your eyes just might have a tear or two. Inside you are celebrating like a mad man, but your body is fatigued. You keep on moving until they put that medal around your neck. You then take yourself to the massage tent, the food tent, the finishers t-shirt tent. You meet up with other Ironmen and trade war stories about the day and finally wants you have contemplated what you have just accomplished you leave the athletes area, go pick up your bike and go see the family and go back home to shower and sleep. If you have done an Ironman you know it doesn’t end there. The day after the event, when you can’t walk properly, and you want to cry at the sight of a flight of stairs. You walk around proudly wearing your finishes t-shirt some athletes still wearing their medals around the neck, knowing you did it. You think back tell the family everything that happened, some parts of the race you remember some you don’t (I know can’t remember sunset). At the awards dinner you have recovered and are walking normal again. Out of all the Ironman that I have done my first Ironman has been my worst race time wise but my best race with achievements. I was lucky enough to finish my second Ironman with a good friend of mine. 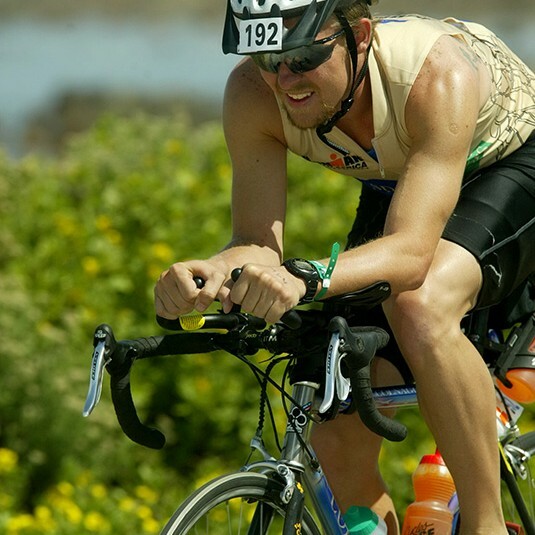 All seven Ironman has taught how strong one’s mind is and how much your body can take a lot. One thing I haven’t mentioned is your family and friends that support you, as you train and on the day of the race, they help you get through. They wake up at the same time as you in the morning stand and cheer you till the end and all the get is a happy athlete, a big hug and a thank. O yes that advice I gave to that foreign athlete to have fun, enjoy and do his best, found out later that he was one of the professional athletes taking part and He finished in the top twenty.